I love great picture frame arrangements for a large wall space such as these. As I was glancing through framing ideas one day I realized these would make a fabulous quilt with large scale prints. Within a day the sketch for this quilt was born. I love these prints from the Heirloom line by Joel Dewberry. The problem was I had a hard time deciding what to do with them because you lose so much by cutting them up. 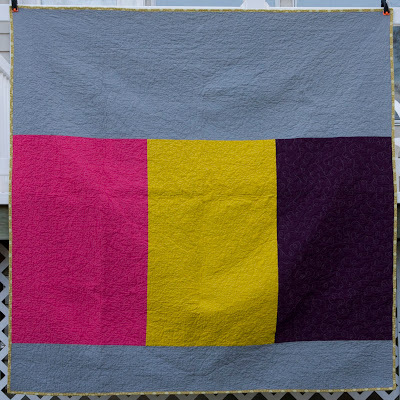 This quilt preserves the prints. I added the borders to frame the arrangement. The sashing is Kona bone which has become a new favorite. The final quilt size is 80"x80". The blocks are all standard photo print/frame sizes-- 5"x7", 8" x 10", 12" x12" and 11" x 14". 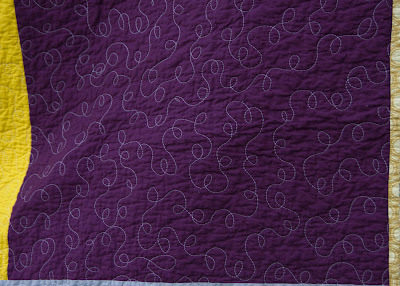 After designing the quilt in Photoshop, I started cutting. It wasn't until I was actually laying the quilt out on my design wall, that I realized this wasn't going to be super easy to piece together. I started to get worried. I had to piece this in large sections and then sew about six 90-degree corners (which, by the way, are easier than piecing 60-degree angles with hexagons) to piece everything together. Sometimes I just jump full-on into a project without actually thinking of how it would all come together. Luckily, it worked out just fine. The back is super simple. I used several colors from the Art Gallery Pure Elements line. 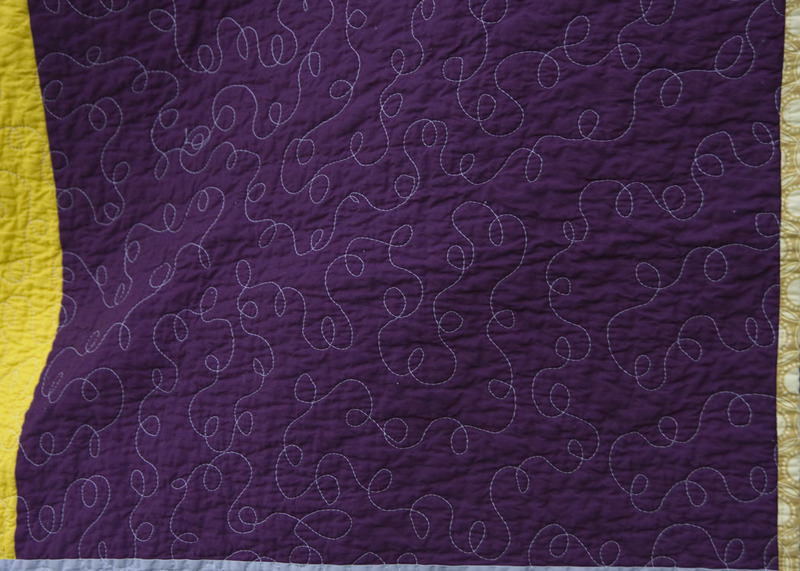 I used grey thread and quilted it on my machine--start to finish-- at our November sewing Saturday. I also spray basted this guy, which is my new favorite as well. This was a Christmas gift for my sister and her hubs. 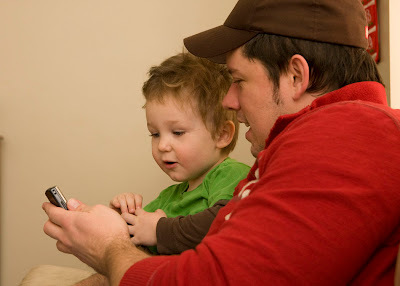 While she was opening the quilt, her hubs was showing Little Dude the wonders of cell phones. I think he wants one of his own. 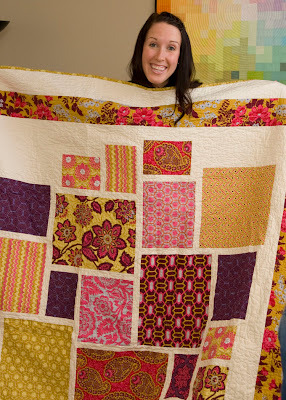 Awesome idea for a quilt, Kati! It is beautiful and I love your quilting. Looks like your sister loved it, too! This is beautiful, Kati! It's a great way to showcase those large-scale prints. I love how big it is - such a great way to show off large prints. What a wonderful gift! LOVE IT! THIS is gorgeous!!!! What a great idea - and it turned out great! I really like it! Love the photo wall layout concept and your choice of fabrics front and back. Nice gift! SUCH a beautiful quilt and so sweet pictures!!! Oh that came out absolutely fab, no wonder she loved it! That is a gorgeous quilt! thanks for sharing. such a great quilt! I love this idea for making use of larger scale prints. Hope you and your family had a wonderful Christmas! Beautiful! 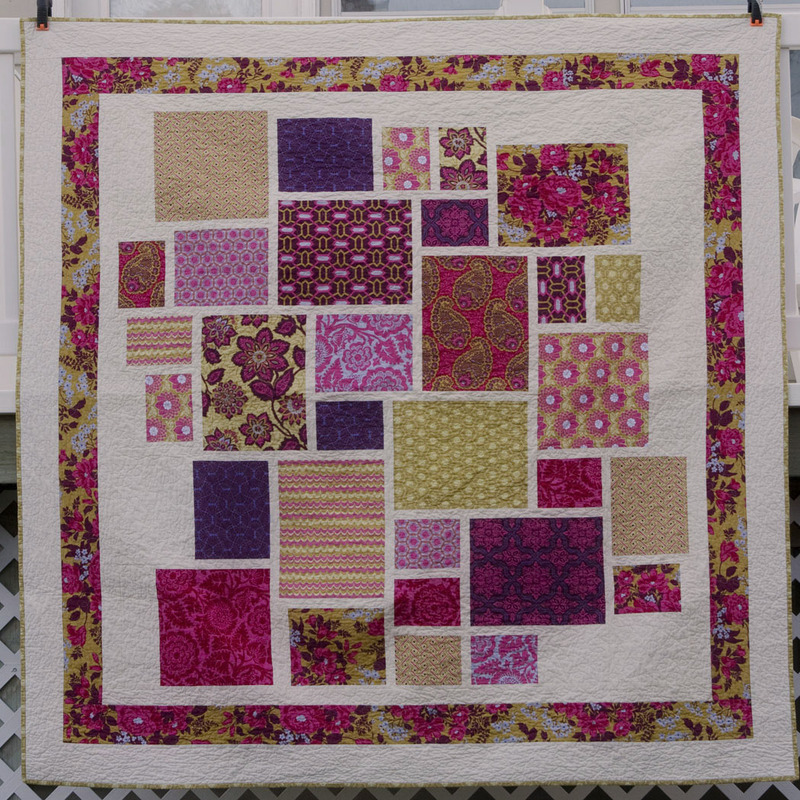 I really love seeing quilts that showcase fabric in larger blocks.